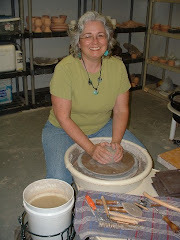 I have been invited to do a painting for the North Carolina Pottery Center's 2nd annual Potter's Palette event. 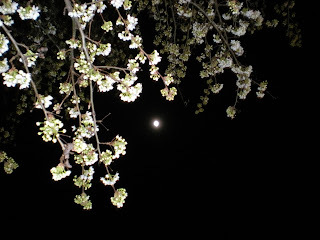 Flowers have been on my mind and this striking view of the moon through my Bradford Pear tree's blossoms caught my eye the other night. There is just something magic about the night and the way things look in moonlight. But, probably won't be doing this image. I wanted to incorporate a piece of pottery in the painting and I think I am going to use my most favorite teabowl. Whenever I need a pick me up, I turn to my Ruggles and Rankin (Rock Creek Pottery), chipped though it is. It's even more valuable to me now, because they aren't making work that I could replace it with. Check back to see how it's going. The painting is due at the Center on April 16th. Best get those brushes moving! I am just fascinated by this vehicle. I've seen it sitting at a McDonalds and this photo was at a KFC. Those little donkies are pretty patient. 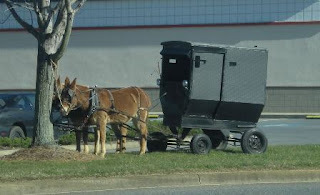 I've even seen it out on the road once, clip-clopping along. Makes me want to burst into a verse of "The Surry with the Fringe on Top" from Oklahoma.... chicks and ducks and geese better scurry! It’s time for the clean out of the studio to make way for creation of more pottery. And no, I am not “quitting” pottery, just shedding some of the material baggage and duplicates I no longer need. Mark Saturday, March 9th from 2:30 to 5:30 on your calendar for the Bluegill Studio Cleanout…………4522 Wilkinson Blvd., Gastonia, NC 28056. For questions about what’s going, call 704-824-9928 or 704-678-6195. • A slew of books, much fiction and philosophy. • A small kiln which has potential as a raku container or a test kiln if you want to do repairs. Call before just “dropping” by, except for times listed above.